Betty A. Williams, 79, passed away on April 21, 2018. 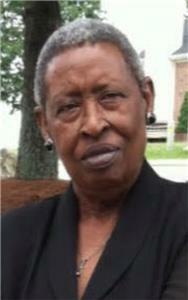 She was a graduate of Howard High School and a member of New St. Mary Primitive Baptist Church. She was preceded in death by her parents, Curtis and Annie Maxwell; son, Marvin Williams, and great-grandson, JiTerrick Nelson. She leaves to cherish her memories her children, Andrew, Harold, and Angela Williams, Willie, Sandra and Robert Norris; sister, Peggy Cochran, brothers, Curtis, Donnie and Paul Maxwell; 10 grandchildren, 16 great-grandchildren, and a host of other relatives and dear friends. The body will lie in state after noon on Friday, April 27, and the family will receive friends from 6-7 p.m. on Friday, at the funeral home. The funeral service will be held at 1 p.m. on Saturday, April 28, in the funeral home chapel with Pastor James Jones officiating. Interment will be in Highland Memorial Gardens.